On Friday, March 13th six unions representing public sector workers in the north of Ireland took joint strike action to resist the austerity programme being pushed through by the Sinn Fein / Democratic Unionist Party (DUP) coalition government. John Mc Anulty, a member of Socialist Democracy in Belfast explains the background. The more optimistic socialist commentators hope to see new Left parties in Europe push back the ongoing austerity offensive. The most daring wave expansively … Greece … Spain …Ireland??? The inclusion of Sinn Fein is partly an echo of their past struggle against imperialism and a legacy of support among socialists, partly because they expend considerable energy in presenting themselves as left -wing. There is support for their claims inside Ireland. The Communist party, left trade union bureaucrats and the SWP imagine that a left government is within reach if we add Sinn Fein to a broad range of anti austerity candidates and independents. Sinn Fein was not slow to take up this idea in the run-up to Irish elections, declaring at their recent Ard Fheis that they will never sit in a government of the right. The problem is that they are in a government of the right – the Stormont coalition in the North of Ireland. Everyone is very understanding about this as some aspect of the Peace Process, but why should they be? Sinn Fein was not forced to be junior partners to the British and Unionists. In government they have capitulated time after time to sectarian pressure moving the assembly to the right. Their programme includes demands for a halving of corporation tax. Their concessions to Orange sectarianism are even more heinous. The rightward evolution climaxed in the recent Stormont House Agreement. Alongside further concessions to the sectarian demands of the Unionists came support for a harsh austerity programme. However the claim was made that a hardship fund would protect benefit claimants. On the basis of this concession Gerry Adams proclaimed that Sinn Fein were a party against austerity both North and South of the border. Sinn Fein have been speaking out of both sides of their mouth since the beginning of the Peace Process, assuring their supporters that they were moving towards a united Ireland and the British and Irish capitalists that they would administer the continued partition of Ireland. That was perfectly possible in the demoralization that followed their capitulation. It is not the case now. There is a mobilisation in the 26 counties around the imposition of water charges and the beginnings of an anti-austerity movement in the North. The result was some very terse discussions with their own members at the ard-fheis, followed by a sudden U-turn on the Stormont House Agreement, with Sinn Fein arguing unconvincingly that they had believed that all claimants would be protected indefinitely. The outcome is a major crisis in the colonial administration. That does not mean that Sinn Fein is now an anti-austerity party. Its disagreement with the DUP and the British is on the very narrow grounds of top-ups to welfare payments which were to be assessed through a complex set of what would essentially be Poor Law Boards. They claim not to have known that the line of credit set aside to protect the vulnerable was not enough to protect everyone and also not to have known that it was a transitional arrangement that would last for a few years. Yet benefit cuts are just a tiny fraction of the misery that Stormont house would inflict on workers and within benefit cuts, top-ups to cuts are only a tiny part of the story. For example, the agreement has a long section on sanctions designed to force you off benefits unless you accept zero hour and more or less zero wage contracts offered by employers. People offered help to offset the bedroom tax will be asked to sign an agreement that they will accept alternative residence anywhere in the North. At the moment private firms are being used to hound the unemployed and leave them without the means to survive. An important element in driving down wages and living standards is 20,000 public sector redundancies. Nonsensically Sinn Fein claimed that redundancies are not loss of jobs, but loss of posts. All the parties have signed up to the Thatcherite ideology that private industry will take up the slack. This is very unlikely to happen on the scale needed and is in any case depends on benefits cuts and the loss of public sector jobs to push wage rates through the floor. Little is said about privatisation. Sinn Fein is comfortable with the process. They are enthusiastic supporters of Public Private Investment schemes, of a “transform you care” scheme that will aid the privatisation of health and social care, and the effective privatisation of housing stock. The privatisation process will be a bonanza for the well-off, another mechanism to increase redundancies and wage cuts and, in the local context, increase political and sectarian patronage when public employment standards no longer apply. On a proposed halving of corporation tax, Sinn Fein speaks in tongues. They have frequently indicated support but, as it becomes obvious that the money will come straight from the welfare budget, they talk about further consultation and guarantees. The Sinn Fein programme in the South should not be ignored. Each year they produce an alternate budget that is carefully costed to match, euro for euro, the budget dictated by the Troika and containing all the bailout payments. Essentially they are claiming that they will walk on water – protecting the poor while paying the bankers – exactly the three-card trick they are trying with the Stormont House Agreement. When popular protests arise they abstain from the protests and claim that the solution to austerity is to put them in government. They came a cropper in the mass mobilisation around water charges. Their position was that they opposed water charges but would obey the law and pay charges. The solution was to put them in government where they would abolish the payments. The result was that they lost a by-election in Dublin to the Socialist Party’s Paul Murphy, who stood as a member of the Anti-Austerity Alliance and on a non-payment ticket. Sinn Fein leaders now claim that they personally will not pay the charge, but the party as a whole does not support non-payment as a strategy. The organisation is a member of the Right2water coalition, but there is no substantial mobilisation of their members on demonstrations. For those outside Ireland it is difficult to explain the sheer chutzpah of Sinn Fein. The organisation uses Divis Mountains above Belfast to display political slogans in large white lettering. In December the slogan was “Stop British cuts.” When Stormont House was signed the slogan vanished. On March 13th, as unions marched against the deal, the slogan reappeared. Sinn Fein is an extreme case of the difficulties that face socialist organisations when they seek to construct electoral alliances. Should we take declarations of opposition to austerity at face value? The story of Sinn Fein suggests not. The real guarantor of unbridled opposition to the capitalist offensive comes from the workers themselves. When they begin to mobilise the degree of freedom for electoral parties narrows quickly. Obfuscation, smoke and mirrors, fall by the wayside. In Ireland we see a substantial mobilisation against water privatisation and the beginnings of mobilisation against austerity in the North. 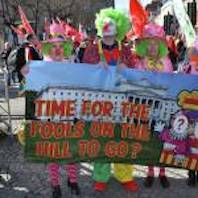 It is this mobilisation that has blown apart the pretensions of the former republicans and it is this mobilisation that offers the possibility of further working class challenges to austerity – which will of course, require an intervention into elections.